Modern women are exhausted. Fortunately, there is a powerful solution that any woman can use to restore her vitality no matter how busy or overwhelmed she feels—yoga nidra, the art of conscious relaxation. 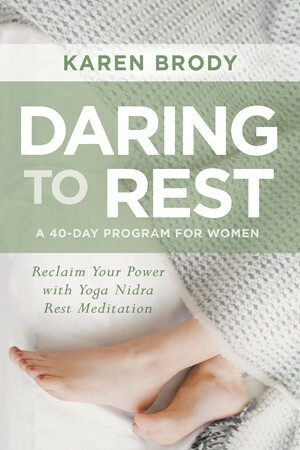 In Daring to Rest, Karen Brody presents a transformative 40-day yoga nidra program, complete with downloadable guided meditations. This book provides an essential resource for helping exhausted women everywhere break the vicious cycle of fatigue and tap into their true power and joy. What if you could reboot your health, tap into your creative self, reclaim your wild nature, lead from your heart—and still feel well rested? Though it comes from the yogic tradition, yoga nidra doesn’t look like a typical yoga class—the entire practice is done lying down. As you listen to a guided meditation, you’re gently taken into complete inner stillness, effortlessly releasing into a healing state that works on both cellular and subtle body levels. With Daring to Rest, Brody presents a comprehensive yoga nidra program that unfolds in three phases: rest for physical exhaustion, release for mental and emotional exhaustion, and rise for tuning in to the “life purpose exhaustion” that can come when we’re not in our full power. Each phase includes a downloadable yoga nidra guided meditation and supportive practices.